My cheap set I had for years finally wore out, so I bit the bullet and got these. Lifetime warranty! I have never used the single cut "Non Ferrous" ones yet. How do you find they work? Have you ever tried the double cut carbide burrs? 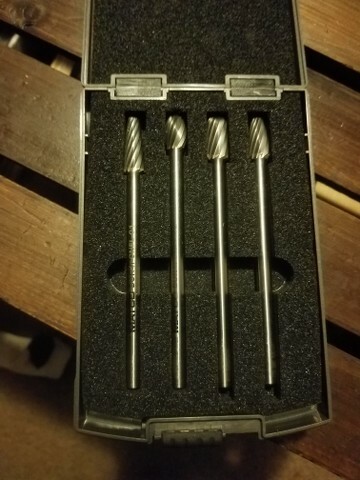 I've been using the same DC carbide set on aluminum for 15 years now and they show no signs of wear. Well worth the extra money. Only thing you really have to watch out for is that they remove non ferrous material very quickly. I have some double cut burrs, they work great! they are not long like these, the single cuts are made for non ferrous metals the double for harder stuff. 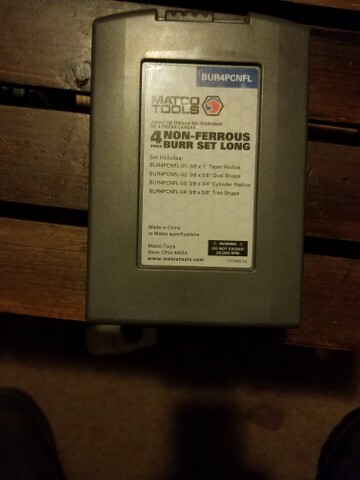 my other non ferrous burrs where from Northern Tool and lasted a long....long time. They were short shank though, and I wanted some longer ones, make porting MUCH easier. The single cut like these won't gum up with non ferrous like the double cut burrs are prone to. 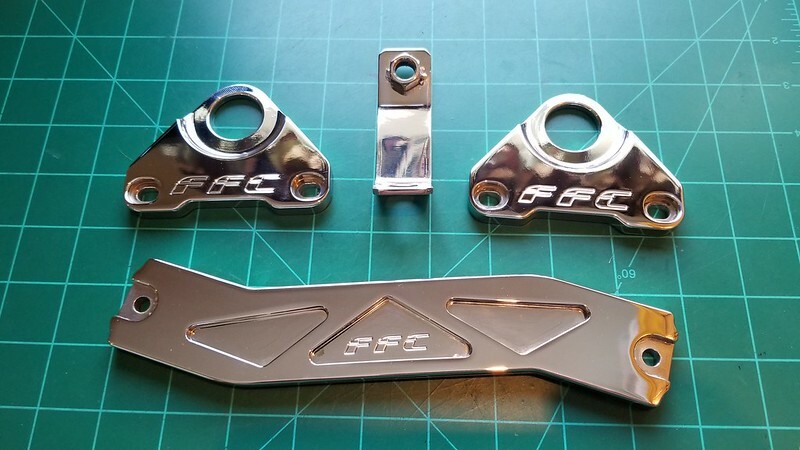 Technically not a new purchase....but I did get a few of my FFC goodies chrome plated. First batch of a small pile of stuff that will be chromed in the engine bay when the H swap goes in. I also already have chromed AC and Alternator brackets, and will be getting the PS bracket done too. I want to rub that on my face. another mini project, bought it with engine damaged and upon dissection, it only needs a cylinder head. It lost a timing chain guide and stopped one of the camshafts. I don't know if you can actually call it a purchase, as they decided to not charge me for the work, but my stuff's back from the powder coater's. 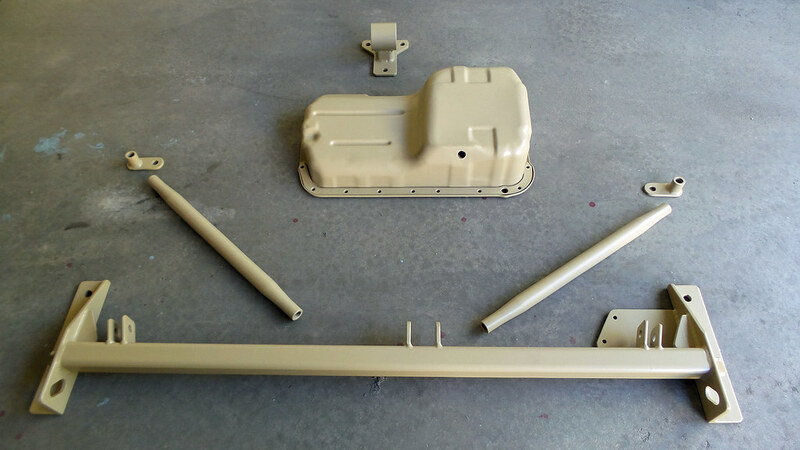 ESP traction bar (specific parts, anyway... it's all very carefully planned out), oil pan, and rear engine mount. 92 EX auto, 190K. Reportedly needs head gasket (partially disassembled). 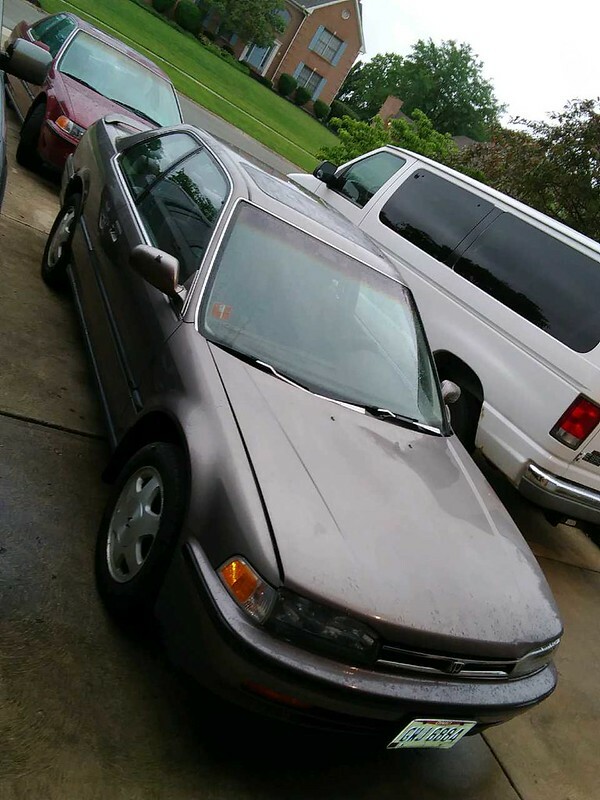 Has new radiator, brakes, exhaust, newer tires, pretty good interior, some dents and rust. The coupe looks good! Makes me want to go find another CB. His history of CBs makes me want to make restorations and flipping of old Hondas a career, haha. Viper roller and whiskey drawer topper. 33"
^ what a color! find your tools in the dark haha! It almost glows in the dark. Got some more suspension goodies in the mail yesterday to wrap up the shock/spring assemblies. The hub is for the '04-'08 TL knuckles I'm using. The spare set I'm sending to have powder coated is pretty rusted, as well as the hubs, so I wanted to have new hubs on them when I get them back. At $13 a piece, I figured what the heck. Unfortunately Amazon only sent me one of them despite ordering a pair. The small package of black things is the bleeder screw covers for the Brembos. The helper springs are Hyperco CS100 4" helpers for the rear shocks and the boots are all KYB SB108s. I would have referred longer helpers and boots in the back, but these seem to work fine after a test fit. Picked up a 1 ton engine hoist (used once) and two engine stands for a C note. Just in time to pull the engine/trans from the wreck. Last edited by fleetw00d; 11-20-2018 at 08:40 PM. 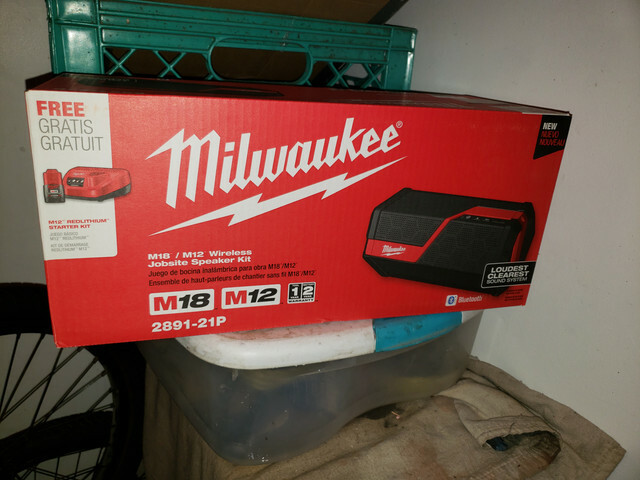 For this particular model, cyber Monday price at Harbor Freight is $180; the stands maybe $50 each. 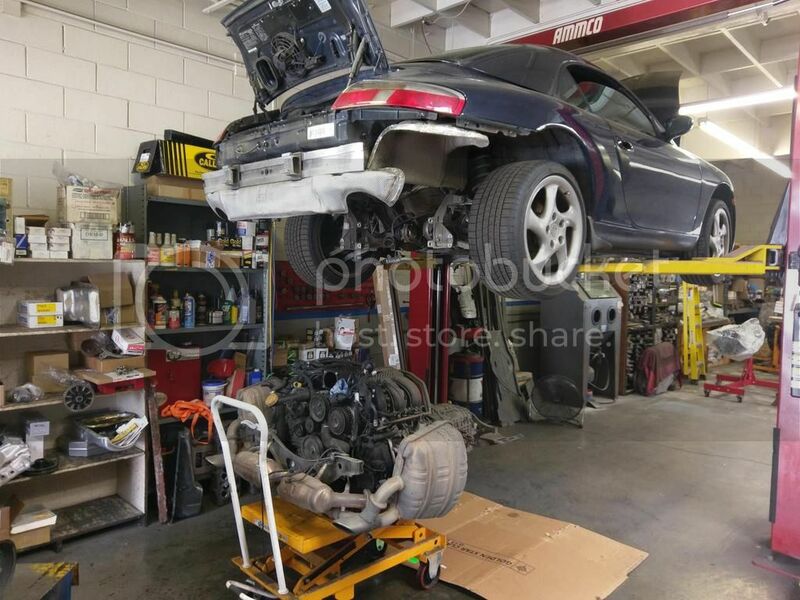 It is only a 1 ton hoist, but it worked to get the engine/trans out of Rose. 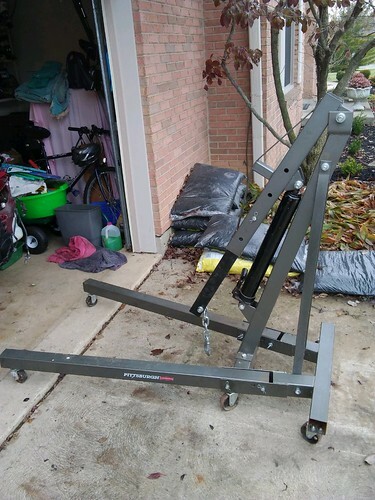 I have a friend selling a 2 ton for $130 - though about buying that and seeing how much I could recover by selling the 1 ton. Last edited by fleetw00d; 11-26-2018 at 09:46 PM. Got some parts for the xB. Doing drums/shoes/cylinders, lower control arms with ball joints(both in one box), inner & outer tie rods, shocks & struts with mounts and bearings, tires, new wheel from the junkyard, and end links. RA sent me one wrong inner tie rod which pisses me off, but it’s okay cause they sent me a 555 tie rod.